Bespoke Gems - Why Choose a Bespoke Gem? Why Choose a Bespoke Gem? Everyone is familiar with diamonds but few realise there is a whole world of coloured gemstones to explore. For many people, their experience of coloured gemstones is limited, usually to the big three; sapphire, rubies and emeralds. It therefore comes as a surprise to people that there are other gems out there that are stunning in their beauty and at a fraction of the price. In the marketplace, the vast majority of gemstones that one sees in the many jewellery shops have been factory-cut and are in effect "mass-produced". These are generally referred to as "commercially cut" stones. 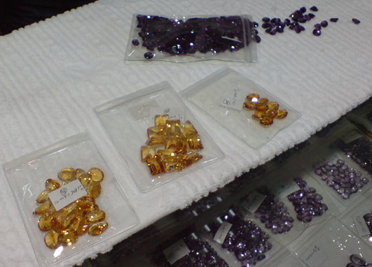 There are very large cutting factories, particularly in Thailand, China and India where gems are literally churned out in their thousands (see pictures below) and they are bought at prices that reflect this fact by jewellery manufacturers. 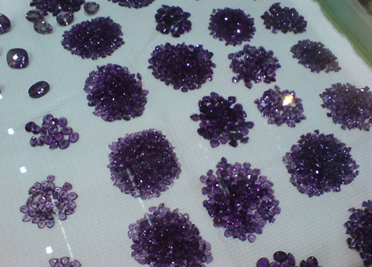 So, what about the quality of these commerically cut gemstones in comparison with a handcut bespoke gemstone? Well, its a bit like comparing a $5 bottle of wine with a $50 bottle of wine. They are both bottles of wine and to the vast majority of people thats all they are and thats all they want. Many people probably wouldn't be able to tell the difference. However, to some people - connoisseurs, collectors, wine buffs or people who simply like good wine - there is all the difference in the world. Handcut bespoke gemstones are your $50 bottle of wine. How do you know what to look for in a gemstone? Well, thats a whole subject in itself. As a guide, I've covered some of the key things to look for here. Have a look and it should get you started. There is a certain joy and satisfaction in owning a finely hardcrafted item, be it a beautiful wooden table, an original painting, a designer dress or what have you. There is a sense of it being something "real" and unique, something that isn't mass-produced or a cheap copy. A handcut bespoke gemstone is one of these things. Each bespoke gemstone is a small work of art. It takes time to cut and polish a beautiful gem and it cannot be rushed. Attention to detail is very important and makes all the difference between mediocre and magnificent. A handcut bespoke gem is something that you will enjoy wearing. Every time you look at it you know it's the real deal. It sparkles better, the colours are richer, the shape more pleasing. These are the gems that are handed down the generations and become family heirlooms. You are wearing a one-of-a-kind work of art. These stones make a great investment because they are special, they are unique... they are different from all the rest and represent the best. As you can see in these pictures below, commercially cut stones are available in the thousands, literally! Sadly there is nothing particularly special or unique about the vast majority of these run-of-the-mill stones. They are cut to standard calibrated sizes in standard designs and shapes. There is another subtle but important thing to know... they are cut for yield first and foremost, not beauty. Its all about getting the biggest return the factories can for their buck. Quantity, not quality. Why is this important? Because it turns gemstones into nothing more then a commodity. Getting the most yield from a stone means something has to be sacrificed and this is usually the brilliance and "light return", the colour (incorrect orientation reduces the colour saturation), shape and design. All of this I cover in more detail here. Lots of commercially cut stones. Lots more commercially cut stones, in this case amethyst.